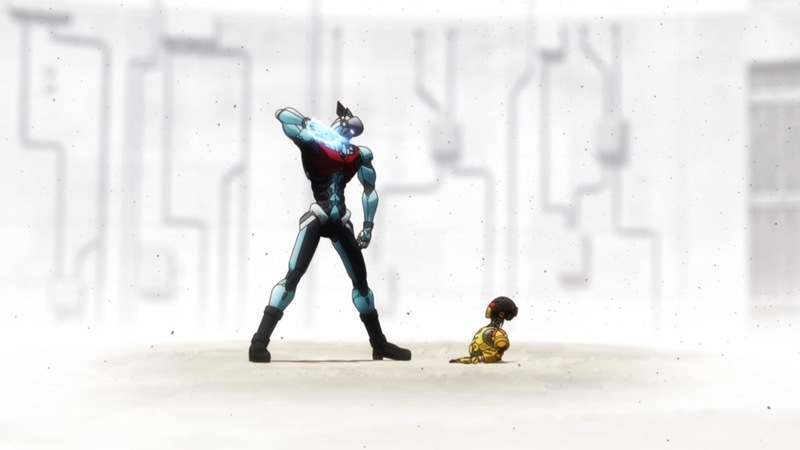 Astro Boy is a name synonymous with manga and anime. 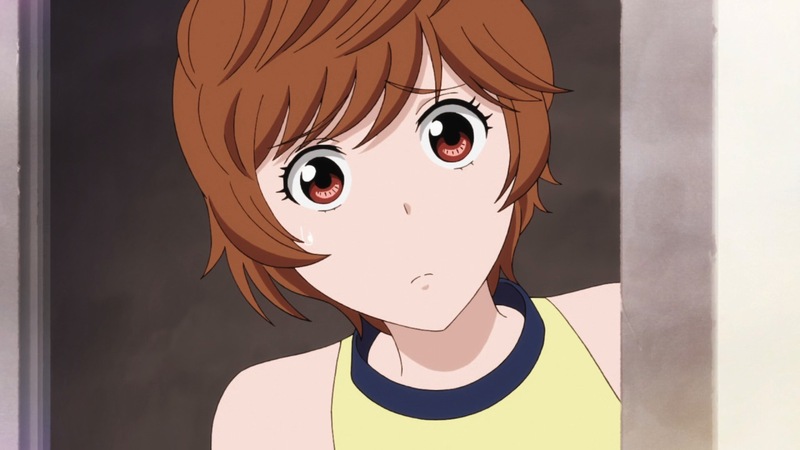 Even if you’ve never read a single chapter, watched a single episode of the various iterations spawned over the years or even heard of its legendary creator Osamu Tezuka odds are that the seminal series has influenced your favourite shows in some way. Since 2014 his son Makoto Tezuka has collaborated with Tetsuro Kashara and Masami Yuki on Atom: The Beginning – a prequel manga which tells of a time before the creation of Mighty Atom (aka Astro Boy). In 2017 the title was adapted into a 12-episode anime series, created in collaboration between studios OLM, Inc., Studio I.G. and Signal.MD. Five years ago Japan was reduced to ruins in a catastrophe known as the Great Calamity. As the country began redevelopment, the field of robotics advanced exponentially and are now robots are ingrained as part of society. Prodigies Umatarō Tenma and Hiroshi Ochanomizu are friends and researchers, looked down upon by the university they attend for their ideas. However together they have created A106 (pronounced “A-Ten-Six” or just “Six” for short), a robot capable of independent thought. 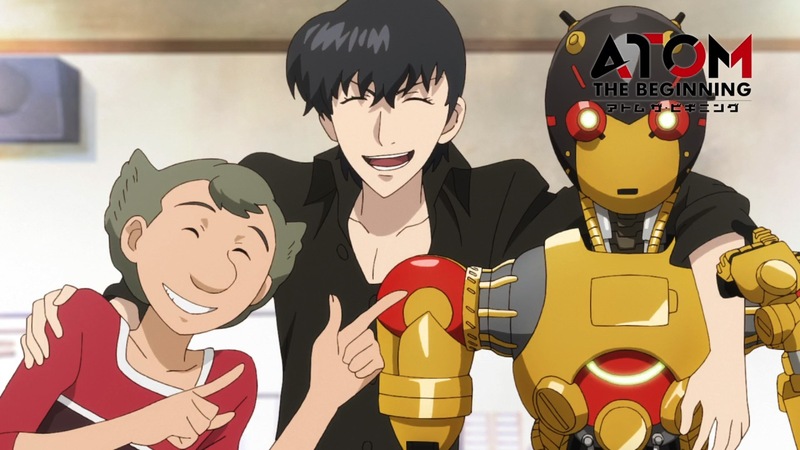 Together with Hiroshi’s sister Ran, fellow student Motoko Tsutsumi and robotics fanatic Kensaku Han, the scientists test A106’s abilities – eventually culminating in an entry into the robot wrestling championship. But as A106’s awareness begins to develop, so does the different ideologies between the two scientists. 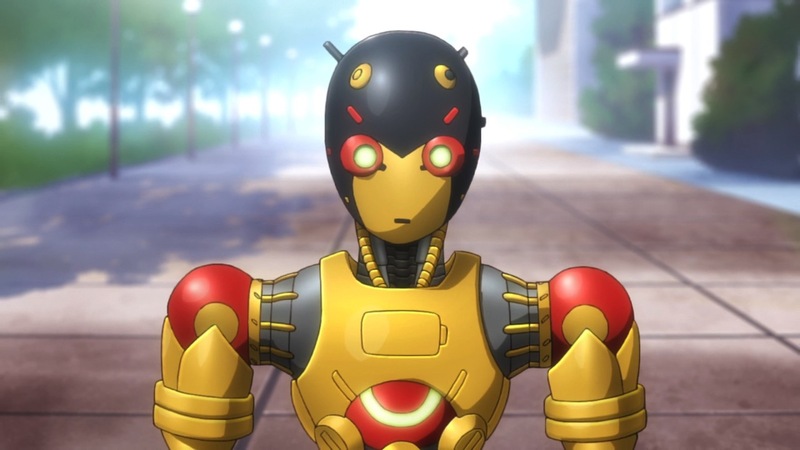 Even without the weight of Astro Boy behind it there’s plenty in Atom: The Beginning for newcomers to take interest in. Its setting is a world where robots of all shapes, sizes and types (including piloted, remote controlled and AI) have become commonplace. However despite these scientific breakthroughs robots are still tools, and in A106 the world is getting its first proper glimpse at a robot not only capable of independent thought, but feeling as well. 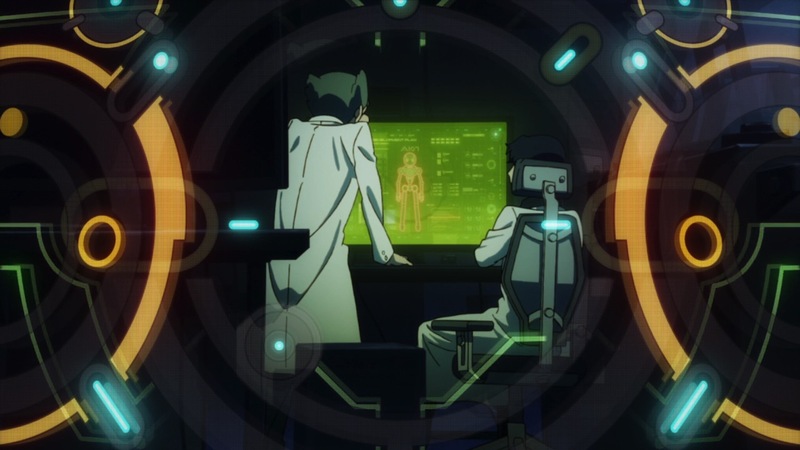 This is the pair’s Bewusstsein system, which in show aims to bridge the gap between humans and robots while for the viewer provides a more philosophical outlook on the show’s otherwise simple premise. 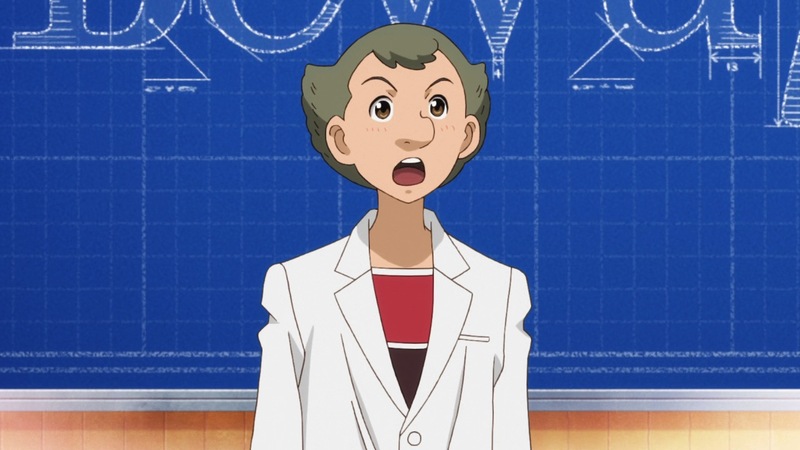 The knowledge of what these scientists are destined to create or their eventual fallout isn’t required to understand the show, nor is a thorough understanding of the Astro Boy story. Certainly existing fans will be able to pick up some of the more subtle references peppered throughout the show, but at no point does the show hinge on any of it. 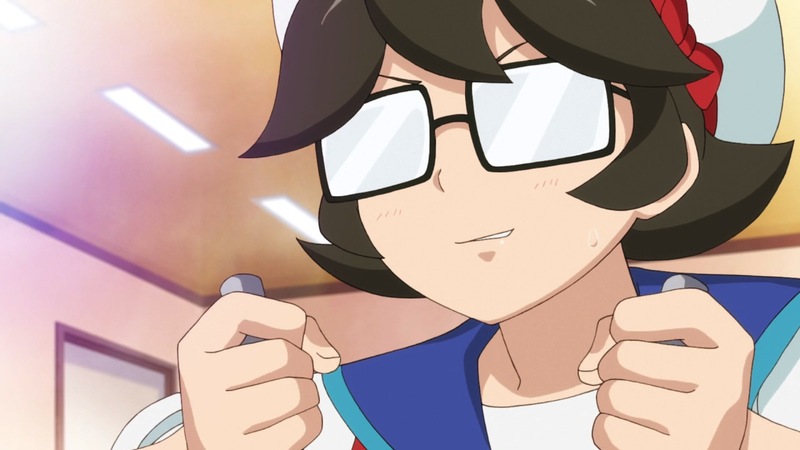 The show also benefits from a likeable pair of lead characters, with Umatarō and Hiroshi complimenting each other perfectly in terms of personality. Whereas Hiroshi is the compassionate dreamer with big ideas, Umatarō is the man of action constantly trying to push the bar. It’s great that the main two characters are so good, because most of the other cast members are just there to occupy space. The only exception to this rule is Ran, who despite not saying or emoting a lot is one of the most genuine and caring characters in the entire series. But a good premise and leads will only take you so far, and unfortunately for the most part Atom: The Beginning simply doesn’t have the content to back that up. After some quick set up in the first few episodes the series quickly delves into a formulaic array of slice-of-life style stories, where some sort of problem arises and it’s up to Lab 10 (or more specifically Six) to save the day. These episodes do have some valuable character development every so often (particularly Ran’s focus episode) and bits of foreshadowing for when the plot properly kicks in, but mostly it’s just inconsequential stories that seem to reiterate the same point. With the series only being 12 episodes long, its precious time wasted. 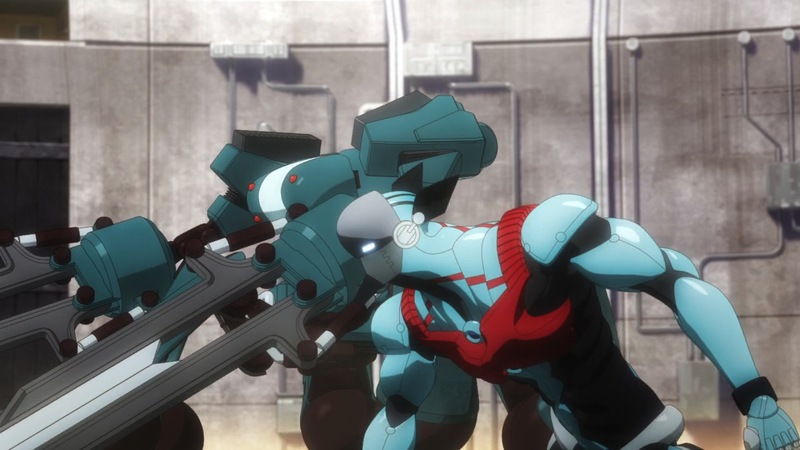 Things really begin to take a turn for the better as the show enters its “robo-wrestling” climax, not only providing the healthy dose of robot fighting action teased in the opening credits but also a more philosophical outlook on events. It’s at this point that we truly begin to dive into Six’s mind and experience the show as he does. His development and perceptions are the true heart of this story, and its only in these episodes is this significance fully realised. Ultimately this breakthrough also proves to be equally bittersweet, as we all know that A106 will eventually be resigned to the scrapheap – remembered simply as progress towards the pair’s real scientific breakthrough, A107 aka Astro Boy himself. However the biggest problem with this series is that ultimately it feels like a tiny chapter in a much bigger story – one viewers may never seen play out on screen. Umatarō and Hiroshi’s eventual falling out is pivotal to Astro Boy’s genesis, and while we see inklings of their differing ideals here there’s little to suggest things will move towards that outcome. 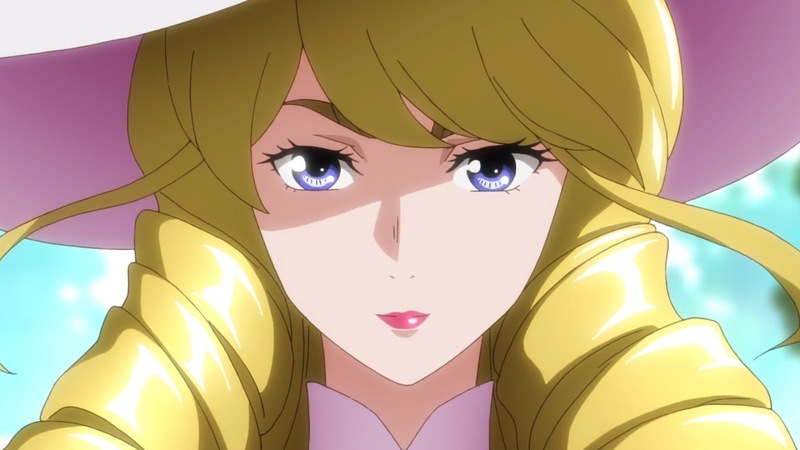 Similarly the Great Calamity may seem like a point of interest, but it’s just a backdrop to explain the overabundance of robots – something the show never really needed to explain in the first place. But at the same time, how can something that big not be important in some way? This problem doesn’t just relate to events either, it also affects characters as well. 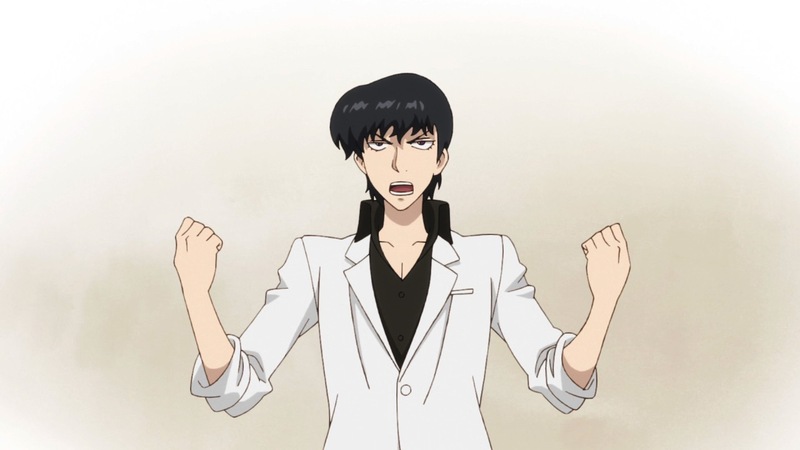 What is the significance of Dr Lolo or Ran’s brother Moriya (this is information I’ve since found out from manga summaries, but the anime itself certainly doesn’t offer anything of value)? With the show only adapting a small part of the manga a lot of what’s presented here simply feels like dead weight – limiting the time spent with the characters or events it does want the viewer to be invested in. Atom: The Beginning is a very fitting name for this series – the problem is just that beginning also happens to be the end. 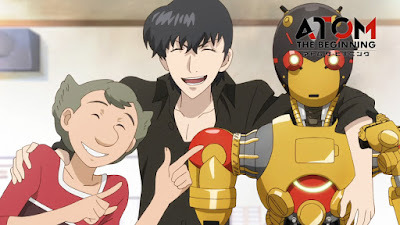 Though through all its flaws, at the very least Atom: The Beginning remains a damn good show to look at. While the show itself can’t ever hope to compete with the beautifully stylised opening sequence, it’s still no slouch when it comes to visuals. Despite a modern staff and production values Tezuka’s trademark character design is still present in both Umatarō and Hiroshi, stretching to a few other extended cast members but perhaps not as much as Tezuka fanatics might hope. Nevertheless it’s a great looking show, presenting its robotic renaissance as a world full of (artificial) life and colour. The robot designs are incredibly varied and each bring their own charm, with A106’s beautifully retro endoskeletal design at the forefront of what the show has to offer. There’s also good use of CGI character models for some of its more intense sequences, which can often come across as stilted and ill-fitting but here work wonderfully – not just in a visual sense but in a thematic one too. Robots are ingrained into society but ultimately detached from them. In the same way these CG models are ingrained into the 2D backgrounds, but don’t fully become part of them. Atom: The Beginning is a series with a lot of really great ideas, but lacks the duration and focus to properly develop them. A formulaic first half eventually gives way to some thought-provoking episodes, eventually reaching its philosophical peak right at the very end. With a tighter plot and few more episodes (especially since it only covers a fraction of the manga) this could have been something really special, but as it stands is probably unlikely to turn many heads. A pity, as while the journey is certainly bumpy the destination leaves you with a lot to ponder.